Studex, per i suoi sistemi di foratura, offre una vasta selezione di modelli di pre-orecchini. Questi orecchini, progettati per la foratura dell’orecchio, sono sempre confezionati in cartucce sterili. Puoi scegliere l’orecchino che più ti piace tra la collezione completa, presso un nostro partner di fiducia. Lo specialista per la foratura dell’orecchio sarà lieto di mostrarti lo strumento Studex e di darti ottimi consigli sulla scelta dei tuoi orecchini e del tuo bambino. Materiali di alta qualità: oro giallo e oro bianco da 18 carati (750) o 14 carati (585), titanio o acciaio chirurgico. Anallergici, nickel-safe, privi di piombo, cadmio e cobalto. The earring backs (butterflies) allow greater air circulation, which promotes the healing process. Our systems meet or exceed EU standards and FDA regulations (U.S. Food & Drug Administration). Good for your ears, yet stylish right from the start. Our studs are available in different sizes. Your ear piercing specialist will assist you in choosing the right size for you or your child. For babies we offer our special Baby Line. This includes our cute gift box for a child’s first earrings (“My First Earring”). Additionally, our Studex partners offer ear piercing gift certificates, which you may pass on as gifts. Since our studs and earrings are particularly agreeable, they aren’t just worn by our customers as piercing studs, but also afterwards. You can wear our piercing studs as long as you wish. Customers frequently switch from other earrings to ours. For this reason we offer the STUDEX® Sensitive and STUDEX® Select earring lines. 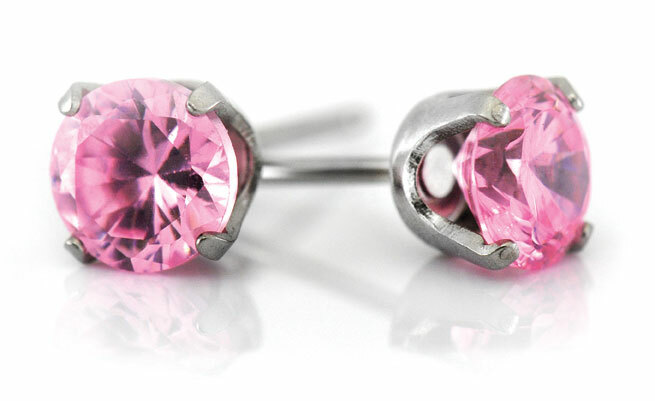 STUDEX® Sensitive earrings are not piercing studs, but high-quality fashion earrings. This is a wonderful earring collection for the more fashion-conscious customer.